I apologize, I’ve been away for a while. First there was the frantic baking of over a dozen kinds of Christmas cookies. Then, traveling for the holidays meant I was away from my kitchenaid and was enjoying hanging out with family instead of with my computer. I borrowed other people’s mixers to make a great chocolate and vanilla almond pear tart for holiday feasting (the pear tart was so good, and we devoured it so fast I made another one the next day). When I got home, the reality of 13.5 GB of proteomics data to analyze and my overdue personal deadline to get a paper written meant I neglected my oven for a while. 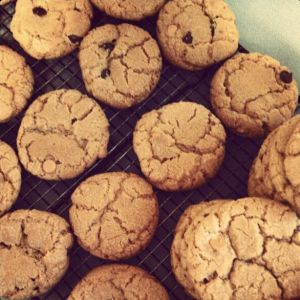 I would probably be going through baking withdrawal at this point except for a quick weekend trip to Minnesota where my Aunt wanted to watch me make my chocolate chip cookies that she hasn’t been able to replicate. To be fair, it’s probably good I haven’t had a chance to write anything until now since I want to talk about a potentially touchy topic. I’ve given you all a couple weeks for your well-intentioned (but perhaps too grandiose) new year’s resolutions* to peter out a bit before I write this post It’s about butter. I went through a phase in college where I strictly avoided butter, but when I started baking regularly I quickly made peace with it’s omnipresence in my fridge. There are textures and flavors in baking that you can only achieve with butter. Butter is what makes pie crusts both tender and flaky, what makes an alluring shortbread sweet and salty in one bite, what gives croissants and other laminated doughs their delicate, pull-apart layers. In other words, it’s essential. Even if you’re not into sweets, a pat of butter is what makes a dry baked potato moist and possibly what convinces your children to eat their vegetables. 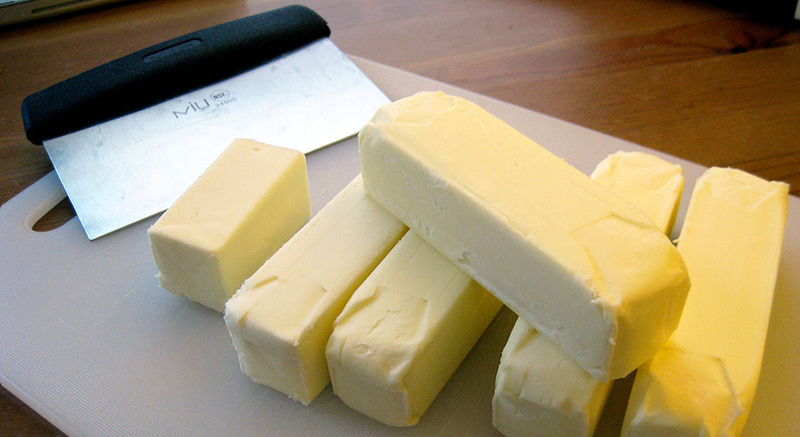 What inspired me to write this post about butter was an experience (revelation?) I had in Boston over the holidays. I was alone one morning and ventured out to Hi-Rise bakery to get some coffee and a breakfast treat to fuel a morning session of literature searching. Scones aren’t usually my first choice for breakfast, but nothing else was appealing that morning, falling into either the not-sweet or too-much-like-dessert-can’t-justify-for-breakfast categories. So I chose a maple pecan scone and headed back to the house. What struck me as I ate that first bite of scone was that I didn’t taste maple or pecan. Instead, I realized that for maybe the first time in my life I had tasted, and was in awe of, butter. Sweet and salty, rich and compelling; this wasn’t the flavor of the grease that soaks a napkin before you even get your first untarnished bite unaware of the butter content and the emotional baggage that can ensue. This was the flavor of something wonderful, perfectly balanced, and practically guilt free. It was the single bite that has again changed my lifelong evolving attitude towards butter from a condiment I ate because it was served with dinner, to a caloric excess to be avoided, to something to savor and enjoy for it’s wonderful richness and flavor. So thank you Hi-Rise for helping me to grow this past year; knowing that I will be moving closer to you will help make my new year’s resolution more manageable! Shortbread is the perfect way to showcase butter. With a limited number of other ingredients, butter really is the star and using the best stuff you can find will pay off here. I categorize shortbread into two types: shortbread + and shortbread – cornstarch. 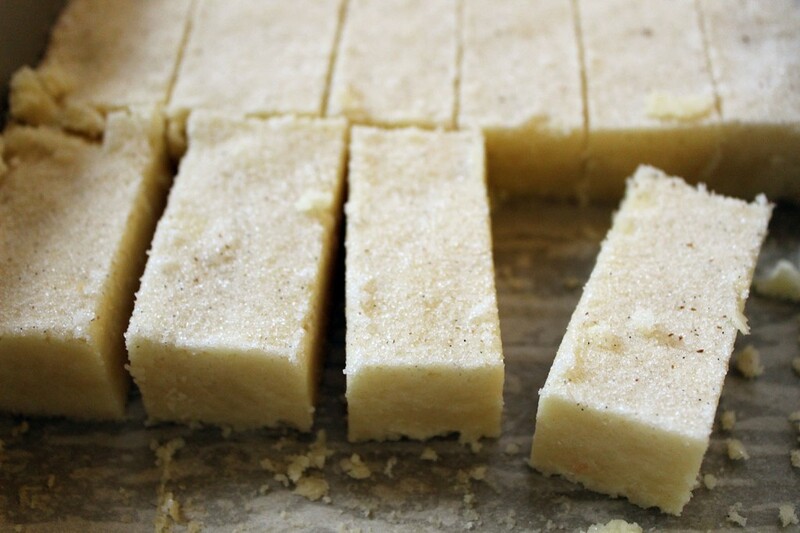 Shortbread + cornstarch has a super tender, fall apart, melt-in-your-mouth texture. The cornstarch doesn’t contribute to the gluten development of the cookie, making the crumb ultra delicate. On the other hand, shortbread without cornstarch develops a more robust gluten network. As the butter melts in the oven, it releases steam that stretches the gluten and creates fluffy pockets and layers in the cookie. Break this kind of shortbread in half and look, you should see the layers (and you should feel like a cookie geologist while you’re at it). Both kinds are good, but it’s the shortbread + cornstarch type that I find truly seductive and swoon-worthy. 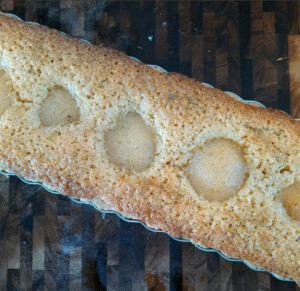 This recipe from Tartine in San Francisco is my idea of a perfect shortbread! Preheat your oven to 325°. Microwave the butter for 10 second intervals until some of it begins to melt. Put the butter into a mixing bowl with the salt and beat on medium high speed until the butter is smooth and very soft. Add the granulated sugar and beat until combined. Whisk together the cornstarch and flour. 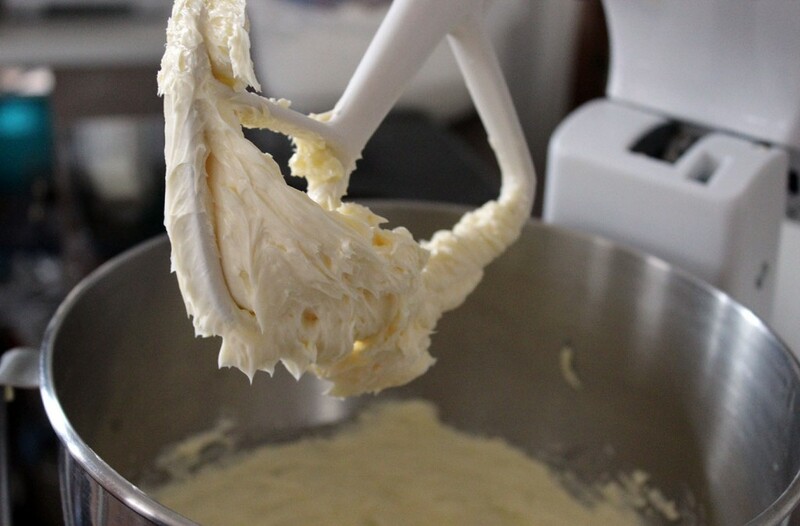 Sift into the butter and mix until a smooth dough forms. Line an 8×8 pan with parchment paper so that the parchment hands over two sides of the pan. Press the dough evenly into the pan. The dough will be soft but shouldn’t be very sticky, take your time to make the dough even since the shape will not change much while baking. Bake the shortbread for 30-40 minutes. The edges should be starting to brown but the middle should still be pale. Take the pan out and let cool. Grind the vanilla sugar (or regular granulated) in a small food processor for a minute or so until very fine. While the shortbread is still warm sprinkle an even layer of sugar on top, tilting the pan to cover the entire surface with sugar. Carefully pour off any excess sugar, making sure to not tilt the pan too much or the bars will slip out. Carefully slice the still warm shortbread into 1x 2 inch bars. Wait until fully cooled to remove them from the pan. *I made no diet related resolutions this year. It was a smart decision given that I stress ate a few too many leftover Christmas cookies my first day back to lab and was relieved I didn’t have to feel guilty about ruining my resolution before the first week of 2013 was even over. Granted, I’m still trying to figure out a resolution this year. Maybe it will be to handle all the impending life changes this year with as much grace and as little anxiety as possible. 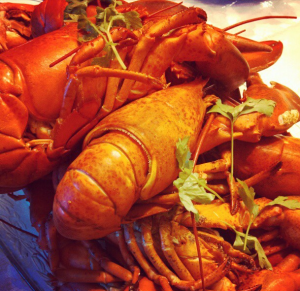 ***There are always exceptions and in this case, when it comes to boiled seafood like lobsters and crabs, copious amounts of butter seems to have universal appeal. 2 Responses to "The Necessity of Butter"
i share your feelings on butter. i’d like to try this recipe to see what you mean about the distinction between shortbread with or without cornstarch. i’ve made it without but i’d like to try this version too! Absolutely the best shortbread recipe I have tried! I increased the lemon zest since I like a stronger lemon flavor and these were exceptional!